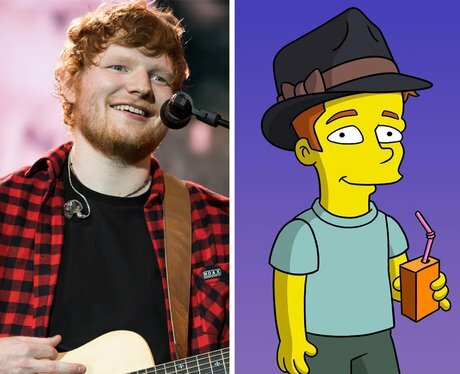 Is there anything better than your fave star popping up in cartoon form? Check out the stars who've been transformed into cartoons, from One Direction and Lady Gaga to Rihanna. One Direction filmed dialogue for this new episode of Family Guy called 'Run, Chris, Run', where Chris Griffin is elected Homecoming King and Stewie tells the 1D boys a horror story involving 'non-skinny jeans'. We're already excited to see them become cartoon characters! 4. Charli XCX in the Angry Birds movie. 5. Katy Perry in her brand own video game app! Bruno Mars' cameo on The Cleveland Show was uncanny - the creators even managed to nail his trademark trilby hat! The teen titan played himself in an episode of the hit cartoon series alongside manager Scooter Braun. The Mother Monster appeared in an episode of The Simpsons called 'Lisa Goes Gaga'. The 'Born This Way' singer described the guest appearance as "one of the coolest things I've ever done'. Her character arrived in Springfield to try and raise the town's self-esteem. Gaga made a non-speaking cameo on the show previously when she appeared briefly as Elton John's date to the Golden Globes. The loud mouthed rapper toned down his usual confident self to play character 'Kenny West' on the hit Family Guy spin-off. After accidentally giving the 'kiss of death' to Springfield's oldest resident, Britney handed a fictitious award to Mr Burns. Rapper, producer and philanthropist took a break from his crazy inventions to star in the American cartoon show. The 'R.I.P.' singer was one of several celebrity cameos, including David Beckham and Andy Murray, in the Adidas animated short film The Cautionary Tale Of Ebenezer Snoop. The animation follows Snoop Dogg as he is shown his past, present and future by several famous faces and is based on Charles Dickens' famous novel A Christmas Carol! The creators of The Cleveland Show nailed Nicki's alter-ego, even down to her trademark crazy hair! J-Lo made her cartoon debut back in 1998 in the DreamWorks animation Antz. The 'On The Floor' singer voiced the character of worker ant Azteca, who falls for Sylvester Stallone's soldier ant Corporal Weaver. The film also boasted a star-studded voice cast including Woody Allen, Sharon Stone, Gene Hackman and Danny Glover. Katy Perry will make her video game debut later this year with the release of The Sims 3 Showtime: Katy Perry. The 'Teenage Dream' singer has allowed her likeness to be used in the game, which will allow players to kit out their creations with wigs, clothing and props all inspired by her 'California Dreams' tour. For the remix of his Vodafone Big Top 40 number one single, Avicii gets the animated treatment - complete with signature baseball cap.